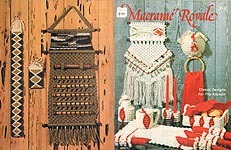 Enjoy Macrame Magazine, published bi-monthly by Pat Depke, Inc. Between 8 - 12 pages, these contain information, techniques, product reviews, and lots of great patterns. 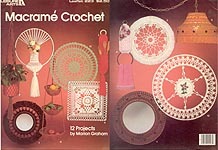 Macrame Crochet, designed by Marion Graham, Leisure Arts, 1982. Projects to CROCHET in worsted weight yarn include: Popcorn Mirror Ring, 14" Window Suncatcher/ Wall Hanging, Spoon- Fork Holder, Towel Ring/ Dried Flower Pouch, Tiffany Lamp, 16" Ring Dried Flower Pouch, 14" Mirror Ring, Hanging Planter, Square Sun Catcher/ Wall Hanging, 19" Wall Hanging, Cluster of Baskets, Winter Rose Snowflake Ring. Very good condition. 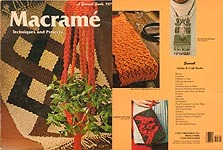 Macrame Techniques and Projects, Sunset Books, 1971, 1975. Macrame Basics plus projects including: Openwork Pillow Cover, Pretty Placemats, Miniature Rainbow Hanging, Eden Pattern Table Runner, Outdoor Plant Hanger, Borromini Hanging, Pagoda Bells Chimes, Mexican Ole Rebozo, Artful Apothecary Jar, Starburst Necklace, Hopi- Style Rope Basket, Nubby Textured Rug, Sculptural Plant Hanger, Cavandoll Clutch Purse, Lacy Choker Necklace, Sampler Shoulder Bag, Leather Thong Belt, Sea and Sand Necklace, Oriental Belt, Snappy Strap Bracelet. Also, photos of Macrame Masterworks. Good used condition -- general overall wear; spine feels like it might be a little fragile. 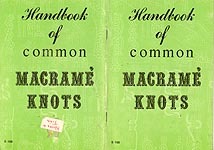 Handbook of Common Macrame Knots, Craft Course Publishing, 1971. Instructions and photographs of Larks Head Knots, Picots, Square Knot, Clove Hitch, Overhand, along with variations, plus Ornamental Knots such as Josephine Knot, Chinese Crown, Monkey's Fist, Berry Knot, Angled Clove Hitch, and more. 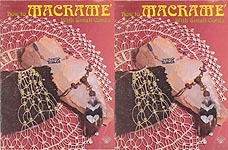 Also, Glossary of Macrame Terms and Hints. Digest- size booklet; cover has tag with former owners' names and some wear, but pages in very good condition. 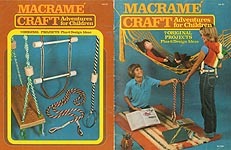 Macrame Playthings, designed by Brenda Zeller and Theresa Miller, Designers Artistic Crafts Inc., 1977. 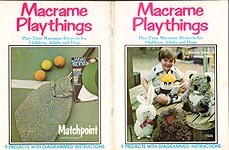 "Play- Time Macrame Projuects for Children, Adults, and Dogs" include: Littlefoot Macrame Monkey, Cuddles the Koala, Puffball the Bunny, Dog Leash, Par 4 Golf Club Mitts, John Seagull, Humpty Dumpty, Matchpoint Tennis Raquet Cover. Shelf wear to cover, but pages in excellent condition. Macrame Royale, Leisure Time Publishing, 1978. Designs for the kitchen include: Fiesta Placemat and Napkin Ring, Calendar Caper Perpetual Calendar, Table Mates Napkin Holder and Salt & Pepper Cups, Butterfly Toaster Cover, Mousetrap Napkin Holder, Measure Minder, Key Minder, California Style Bread Tray, California Style Table Setting (Candle/ Salt & Pepper Holders, Glass Holder, Sugar or Jam Cover), Winter Morning Napkin Holder, Woodsy Owl Trivet, Coaster Characters (Snail, Butterfly, Mug, Beagle, Circles), Daisy Lid, Sunflower Lid, Chicken Towel Holder, All Keyed Up Key Holder, Collector's Spoon Rack, Scissor Holder. Front Cover/ first page has been wet had dried wrinkled -- rest of pages in very good condition. 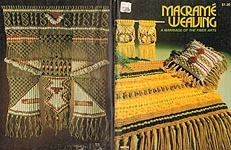 Macrame Weaving, designed by Linda Krauss, Leisure Time Publishing, 1977. Fiber Arts designs include: Kachina, Desert Star Hanging, Tribal Drum Plant Hanger, Sandstone Hanging, Lace Table Mat, Les Papillions Table Rack, Beehive Plant Hanger, Wave Length Cushion, Softly Elegant Cushion, Day and Night Plant Hanger, Meadow Wall Hanging, Sun Spot Hanging, Morning Plant Hanger, It's A Cinch Belt. Has apparently been wet along bottom margin -- wavy and some water staining about 1/4" up pages. Otherwise, very good condition with no detectable odors. 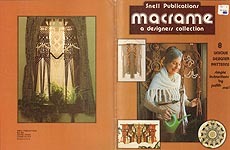 Snell Publications: Macrame - A Designers Collection, designed by Judith Snell, Catherine Kaufman, Beverley Ardith Don, and Bob Arrigo, Judith Snell Limited, 1976. Designs include: Starburst Wall Hanging, Trilogy Plant Holder, Inca Motif Hanging, Reflection Hanging, Throne of Kings Hanging, Bermuda Triangles Hanging, Jet Set Hanging. Excellent condition. 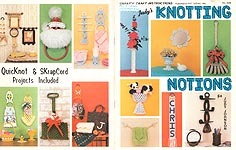 Judy's Knotting Notions, designed by Judy Johnson, Pat Depke Inc., 1980. Designs include: Macra- Madness, Macrame ABC's Name Swag, Candle Holder, Pipe 'n Pouch Rack, Petite Swag, Spicy Towel RIng, Basket, Multi- Purpose Basket, Plant Hanger, Two Styles Plant Chains, All Purpose Caddy, Sparkling Reflecitons, Macrame Rake, Decorative Wall Hanging, Compote, Clutch Purse, Pipe Rope, Message Center, Button Push Pins, Zig- Zag Wall Hanging, Petite Reflections, Petite Towel Ring (4 styles), Twist Towel Ring, All Purpose Swag, Diamond Reflections, Phone Caddy, Twist Towel Rope, Snow Shovel, Snowman Towel Ring, Snowman Ornament, Ring- A- Ding Wreath, Wreath Ornament, Santa Towel Ring, Pencil Holder, Spice Rope, Treasure Tote, Glass Holder, Toothbrush Holder, Towel Bar, Nursery Catch- All, Nursery Lampshade, Nursery Hang- Up, Nrusery Reflections, Bud Vase, Egg Stand. Tag smudge on cover, but otherwise very good condition. 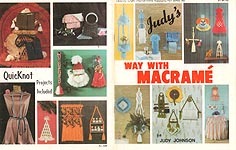 Judy's Way with Macrame, designed by Judy Johnson, Pat Depke Inc., 1979. Designs include: Button Belt, Jingle Bell Pull, Mini Bell Pull, Mini Broom, Mini Shelf, Mobile, Neck Vest, Paper Holder, Paper Towel Holder, Pedestal Caddy, Peppermint Bell Pull, Salt 'n Pepper Hang Up, Curtain Tie Back, 3- Tier Shelf, Two Tone Belt, Spray Can Cover, Christmas Tree, Jolly Santa, Joy, Blue Diamonds Table, Bouquet Basket, Broom, Butterflies & Lace Planter, Double Diamond Mini Hanging, Mini Bouquet Basket, Table Lace, Bozo Clown Clock, Button Lace Lamp, Button Lamp, Flower Time Clock, Oriental Charm Clock, Pom Pom Lamp, Mallard Clock,Cookin' Caddy, Mug Rack, Spice Rack, Spponin', Mushrooms Planter, Owl Planter, Springtime Planter, Strawberry Planter, Sunny Planter, Buckle Shoulder Bag, Evening Sparkle Purse, Fringed Evening Purse, Plain Shoulder Bag. Former owner's name stamp on inside front cover; otherwise, very good condition. 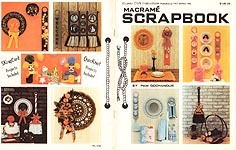 Macrame Scrapbook, designed by Pam Gochanour, Pat Depke Inc., 1979. Designs include: Memory Mat, Placemat, Napkin Ring, Coasters, Glenda's Wallhanging/ Curtain, Anything Goes, Chantilly Lace Wreath, Dried Flower Wreath, Magazine/ Log Basket, Wicker Mat, Wicker Clock, WIcker Mirror, Ribbon, Ribbon Towel RIngs, Hanging Shpere, Standing Towel Rings, Country Sunshine Clock, Country Sunshine Mirror, Card Holder, Santa & Clown Heads for Card Holder, Bow, Bell, Hanging Table, Plant Hanger, Towel Bar, Paper Holder, Ring Towel Holder, Broom, Candy Cane, Purse for Little Girls. Very good condition. 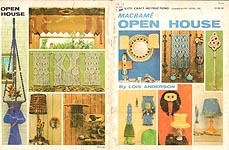 Macrame Open House, designed by Lois Anderson, Pat Depke Inc., 1979. Designs include: Ming Maze Bell Pull (2 sizes), Hob Nail Swag, Hob Nail Mirror (2 stules), Tie for Dad, Sqpares in the Round Lampshade, Moon Gate Mural Wallhanging or Headboard, Pocket Clock, "The Eric Special" Car, Trinket Treasures, Lotus Lite, Wall Vase, Pocket Towel Ring, Mandarin Owl (2 sizes), Pagoda Lamp, Ribbon Lampshade, Lacy Picot Shade, Companion Towel Bar, Imperial Hanger or Table, Mini Bell Pull (Key Ring and Door Knob Decoration variatons), Golden Diamonds Valance, Everybody's Uncle (3 sizes), Shangri La Shade, Oriental Garden, Looped Square Knot Picot Bell Pull. Heavy cover wear, but pages in good condition. 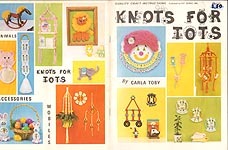 Knots for Tots, designed by Carla Toby, Pat Depke Inc., 1980. Designs include: Lester Lion, Circus Wagon (2 sizes), Bead Clown, Bead Bunnies (2 sizes), Ernie Elephant, Rocky the Horse, Baby Balloons, Come Sail Away, 3- Ring Circus, Clarence Clown, Cissy Cat (3 variations), Peek- A- Boo Planter, The Center Ring (2 variations), Bead Lion, Loves Me Loves Me Knot, Under the Big Top Mobile, Double Diaper Shelves, Diamond Dazzler Mobile. Price crossed off on cover; otherwise, very good condition. 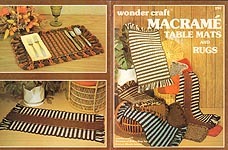 wonder craft Table Mats and Rugs, wonder craft Division of Robin Rugs, Inc., nd. 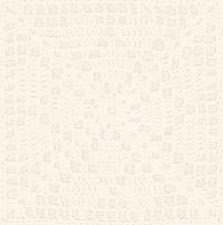 Designs include Table Mat, Two Tone Table Mat, Two Tone Rug, Three Color Rug. Good condition. 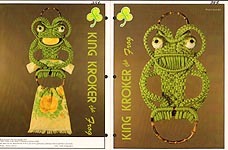 King Kroker the Frog, designed by Barbara Sullivan, Sullivan's Macrame Supplies, 1977. Soap, washcloth, and towel holder. One note -- looks like pattern correction. Otherwise, very good used condition. 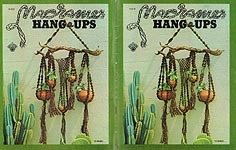 Macrame Hang- Ups, designed by Bruce Morrison, Craft Course Publishers, 1973. Projects include: The Nautical, Phoenix, Illumination, Night Song, Bells of Araby, Western Elegance, ChanChan, Aquitaine, Peru, Oriental Serenity, Jewel of Kyrenia. Former owner's address stamp, pencilled note inside front cover. Otherwise, very good condition. 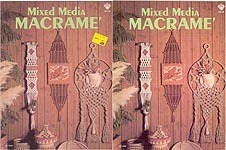 Mixed Media Macrame, designed by Pamela Barickman, Craft Course Publishers, 1978. Projects include: Soriya Sanctuary, Pampas Pouch, Pandora's Perch, Jakarta Jewel, Mojave Mesa, Sunrise- Sunset, Poseidon Paragon, Nymph of Njorth, Cook's Caddy, Sequoia Spirit, Woven Weed Pouch, Sculptured Weed Pot, Sheherazade. Also includes Macrame Knots and Weaving Techniques. Price sticker on cover; otherwise, very good used condition. 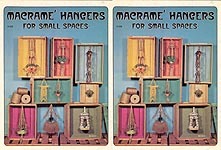 Macrame Hangers for Small Spaces, Craft Course Publishers, 1975. Projects include: Sparrow's Spa, Gypsy Plaits, Ramona, Impressions, Indiaon Rope Trick, Swallow's Nest, Juty Juty Juty, Pagoda, Interlude, The Littlest Angel, Space Needle, Lyric in Ivory, Intercircle. Shelf wear to cover, but otherwise very good condition. 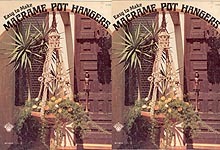 Easy to Make Macrame Pot Hangers, designed by Carol Greenwood, Craft Course Publishers, 1974. Projects include: Rapunzel's Braids, Padilla's Planter, Adobe, Mac- o'- Lantern, Desert Symmetry, Viva Rojas, Juanita's Pride, Sun Song, Sea Wind, Green Sorcery, Gentle Refrain, Driftwood Rhapsody, Texas Topaz. Stickers on cover, shelf wear, but pages in very good used condition..
Macrame With Small Cords, Craft Course Publishers, 1975. Projects include: Amber Chatelaine, Old World Doily, Macra- Minnikin choker, Exotica necklace, Sea Nymph necklace, Temple Bells hanging, Featuer Fancy necklace, Snowballs ornaments, Vagabond choker, Tracery necklace, Wise Guy owl, Primative hanging. Slight shelf wear to cover; otherwise, very good condition. 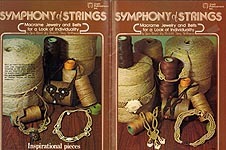 Symphony of Strings: Macrame Jewelry and Belts, designed by Gwen Baird, Liz Barfield, and Tracy Williamson, Craft Publications Inc., 1976. Projects include: Looping Collar, Ceramic Tube Necklace, Olive Wood Necklace with Variation, Chokers, Belts, Green Looping Necklace, Chinese Crown Collar and Bracelet, Sundial Shell Necklace, Spanish Lace, Berry Necklace, Three Shells Necklace, Show Piece. Excellent condition. 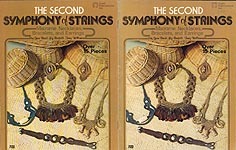 The Second Symphony of Strings: Macrame Necklaces, Bracelets, and Earrings, designed by Gwen Baird, Liz Barfield, and Tracy Williamson, Craft Publications Inc., 1977. Projects include: Polonaise necklace, Serenade Choker, Symphonie Necklace & Earrings, Mazurka Necklace, Fantasie Necklace, Concerto Necklace, Sonata Necklace, Etude Necklace and Earrings, Rhapsodie Necklace and Earrings, Valse Necklace and Bracelet, Prelude Necklace and Earrings, Nocturne Necklace, Melodie Necklace, Rondo Necklace. Very good condition. 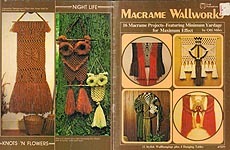 Macrame Wallworks, designed by Otti Miles, Craft Publications Inc., 1978. Projects include 12 Wallhangings and 4 Hanging Tables: Creative Contrast Wallhanging, Geometry With Knots Wallhanging, Nature Knots Wallhanging with Planter, Table Duet, Table Fancy, Fancy Strands Wallhanging, Wall Wakener Wallhanging, Soaring Wallhanging, Triune 3- in- 1 Wallhanging, Striking Stripes Wall Rug, Elegante Hanging Table, Shelf- Table Showoff, Abstract in the Round Wallhanging, Knots 'n Flowers Wallhanging, Night Life Large Owl, Night Life Small Owl. Some cover & spine wear; pages in very good used condition. 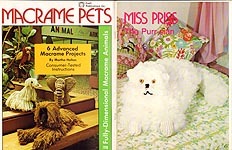 Macrame Pets, designed by Martha Holton, Craft Publications Inc., 1977. Projects for 3-d animals include: Salty Sam the Parrot, Shaggy Aggie the Alpaca, Duke of Pedigree the Afghan Hound, Rajah the Elephant, Miss Priss the Purr- sian, Mandrake the Mallard. Excellent condition. A Soft Touch for Macrame, designed by Muriel Pollock, Craft Publications Inc., 1977. 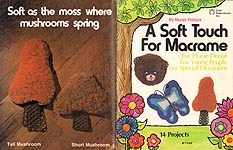 Fuzzy projects for Home Decor, Young People, and Special Occasions include: Panda, Brownie Bear, Frog,Pogo Possum, Baby Owl Towel Hanger, Fall Acorns, Monotram, Autumn Butterfly, Spring Butterfly, Jack O Lantern, Tall Mushroom, Short Mushroom, Christmas Wreath, Snowman. Very good condition. 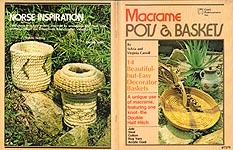 Macrame Pots & Baskets, designed by Sylvia and Virginia Carroll, Craft Publications Inc., 1978. 14 "Beautiful but Easy Decorator Baskets" in double half- hitch knots include: Old Phoenicia, Byzantine Basketry, Cottage Style Bread Basket, Navajo Knots, Paiute Pouch Weed Pocket, Bird's Nest, Primitive Mosaic, Aztec Artcraft, Pueblo Olla, Mexican Platter, Christmas Knots Candle Holder, Basque Beauty, Danish Vase, Nordic Notion. Very good condition. 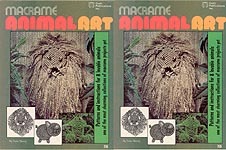 Macrame Animal Art, designed by Susan Shwartz, Craft Publications Inc., 1976. Projects include: Pork Chops, Fiber Frog, Honorable Knot- so of Siam cat, Leo the Lion, Jerome the Giraffe,, Cherie the Poodle, Forget- Me-Knot the Elephant, Sir Mop the sheepdog. Slight shelf wear to cover; otherwise, very good condition. 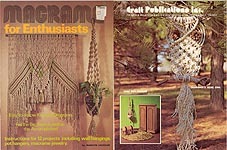 Macrame For Enthusiasts, designed by Marilyn Leuszler, Craft Publications Inc., 1975. Projects include: Natural Suspension, Miniature Pot Hanger, Picot Pot Hanger, Wing Span Hanging, Knot for Shoppers Only Shopping Bag, 2 Macrame Necklaces, Macrame Neckband, Arabid hanging, Tulip Tie- Up hanging, Woven Diamonds hanging, The Circle Route hanging, Grandma's Rope Owl. Center page detached from staples, slight shelf wear to cover; otherwise, very good condition. 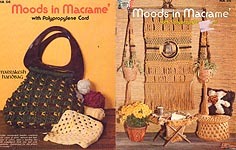 Moods in Macrame with Polypropylene Cord, Hazel Pearson Handicrafts, 1977. Projects include: Pretty Pots Pot Covers, The Companion Magazine Rack/ Table, Marrakesh Handbag, Bells of Yama Hanging, Flambeua Plant Hanger, Starfire Throw Pillow, The Nubian Wall Clock, The Mimic Wall Mirror, Minaret Plant Hanger. CONDITION PROBLEMS: tag on front cover; someone has put numerous slashes through the entire pattern book with a razor knife or box cutter. EVERY page is slashed. However, all instructions are here and readable. 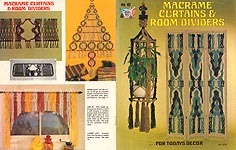 Macrame Curtains & Room Dividers, designed by George Smith, Hazel Pearson Handicrafts, 1975. Projects include: Contempo Screen, Queen Anne's Lace Curtain, Jade Portal Archway Hanging, Hanging Plant Room Divider, Van- Tastic Van Curtain, Wine Rackand Book Shelf Hanging, Navajo Wall Hanging or Window Curtain, Cafe Ole Curtains, O Christmas Tree Hanging. Very good used condition. Macrame Craft Adventures for Children, Hazel Pearson Handicrafts, 1979. Projects include: Swirling Summer Swing, Climbing Rope/ Round Swing, All- In- One Tote, Sunshine Hammock, Rainbow Backpack, Monkey Ladeer, Sleeping Mat. Very good condition. 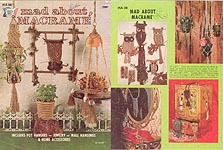 Mad About Macrame, designed by Joyce Bennett, Hazel Pearson Handicrafts, 1975. Projects include: Luminaria plant hanger, Sir Oliver Owl plant hanger, HangingTable Lamp, Trading Bead Necklace, Fringed Owl, Knotty Owls, Twilight Tapestry, Bushy Tailed Owl, Sweet 'n Simple plant hanger, Garlic Bag, Expandable Dup plant hangars, Itsy- Witsy Jewelry Owls, Lamplighter plant hangar. Name written on cover, cover wear, cover partly torn up spine, slightly dog- eared. Pages in good used condition.